The 2011 Johannesburg Visiting School ‘Digital Constructions’ was an intensive, ten-day programme organised through a collaboration of the University of the Witwatersrand (Johannesburg), the University of Hong Kong and the Architectural Association (London). Organised in collaboration with PG Bison and Glass South Africa, the programme included lectures, tutorials and a workshop which aimed at the design and construction of innovative urban dwelling prototypes. The workshop aimed to introduce participants to the most current digital design and fabrication technologies, as well as to discuss the potentials of their implementation within the challenging context of Johannesburg. 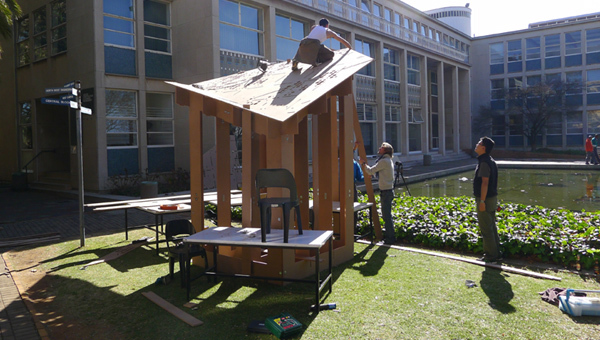 As outcome, the workshop produced two full-scale prototypes, exhibited in front of the Architecture building of the University of the Witswatersrand. Starting with software tutorials and exercises in digital design and fabrication processes, the programme introduced participants to methods for creating fabrication-based, open-ended design systems that can incorporate programmatic and site-specific criteria. The implementation through digitally controlled fabrication processes such as CNC and laser cutting will allow for the testing and the evaluation of functional prototypes, leading to the iterative development of calibrated and realistic digital design models. 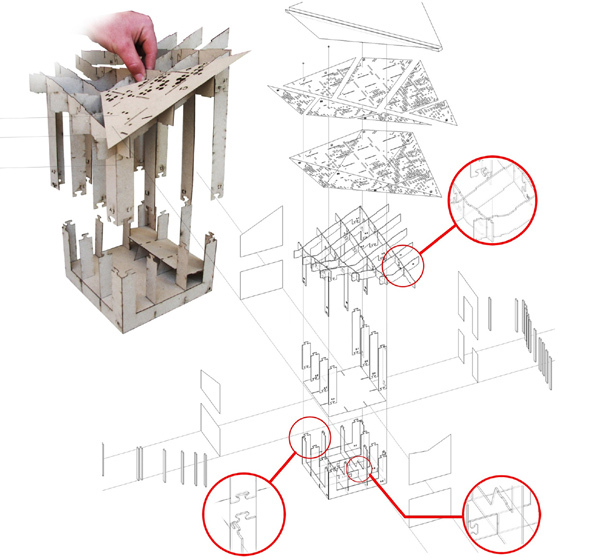 In the second phase of the workshop, the design strategies were applied to the specific programme of a prototypical housing unit, to be constructed in collaboration with local fabricators using equipment and materials made available for 1:1 construction. Participation within the workshop was through team work, combining design development and project management to implement an integrated file to factory work flow. A public final presentations served as a platform to discuss the work with local specialists, projecting the potentials of the design projects for future application within the city.